This article shows you how to edit an invoice. Only those invoices with a status of Draft can be edited. Click Invoices. This page lists all of the invoices you created. Each entry in the grid a link to the customer's invoice. Click Edit Invoice The invoice opens in edit mode. Edit the details you want to change. For example, you can change the header details, including the customer's name. 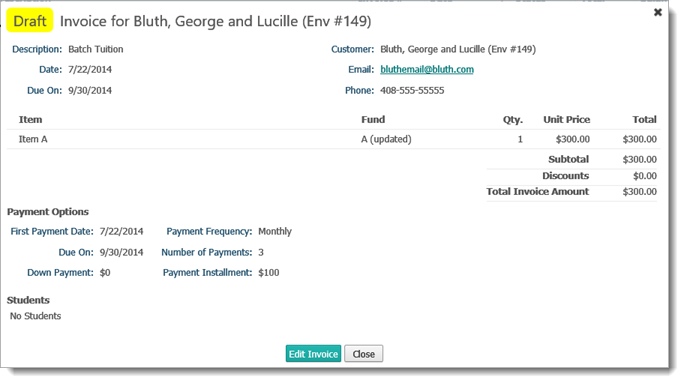 You can also add or remove invoice items and modify or add a payment plan. Click OK to confirm. The software displays a message to inform you that the invoice was finalized. The status of the invoice is set to Ready. Click Close to exit the message and return to the Invoices page. The invoice is listed in the grid. The Status column shows Ready as the status. The finalized invoice can no longer be changed.